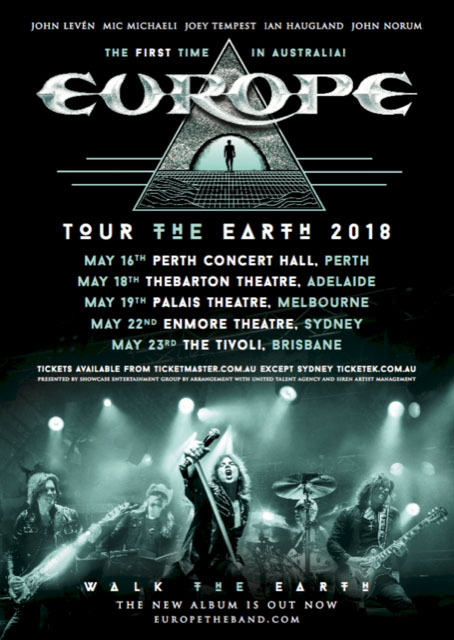 Sweden’s legendary hard rock band Europe, best known for their worldwide 1986 smash hit The Final Countdown, have announced a run of Australian dates in May 2018. This will be the first time the band has toured Australia in their 35-year career! Featuring the classic lineup of Joey Tempest (lead vocals), John Norum (guitar), Mic Michaeli (keyboards), John Leven (bass guitar) and Ian Haugland (drums), Europe have achieved total worldwide sales in excess of 25 million, with the 1986 mega-hit The Final Countdown reaching No1 in 25 countries. The band’s live set will feature all their hits together with fan favourites from all their studio albums. Originally formed in 1979 in a small suburb on the outskirts of Stockholm, heavily influenced by British rock giants such as Thin Lizzy, UFO, Led Zeppelin and Deep Purple, the band began to formulate their own sound. After winning a rock band competition in 1982, where first prize was a recording contract and with a name change to Europe, the world was soon at their feet. After the release of their first album, the self titled Europe in 1983, the band signed with Sony Epic Records, New York and in 1984 their second album Wings of Tomorrow set the path for future worldwide success. With their aforementioned third release, The Final Countdown, the band had arrived. The Final Countdown spent 70 weeks in the US Billboard top 100 and produced four top 40 singles. With continued touring and sell out concerts all over the world the band released two more albums, 1988’s Out of This World and 1991’s Prisoners in Paradise, but after 10 years of solid recording and touring and the changing music scene that put “Classic Hard Rock” on the back burner, the band decided to take a break. After enjoying the 90's releasing solo albums and touring in other constellations, in 2004 the band met up again after realising their journey was no where near complete. The original line up reformed and released album number six Start From The Dark the same year. The band retained the old fans and at the same time regaining new ones. The coming years saw constant touring with headline festival appearances together with vast critical acclaim for their new album releases - Secret Society in 2006, Last Look at Eden in 2009 and Bag of Bones in 2012. 2015 saw the release of War of Kings which was later awarded a prestigious Classic Rock Award in the UK. This record put the band back at the top of their game. The album’s success saw the band tour the USA twice, the first time the band had been there in 10 years, together with other territories, some brand new and some back for the first time since the 80s. 2016 saw the 30th anniversary of The Final Countdown and to celebrate the band played a series of special sold out concerts around Europe where they played the album in it’s entirety for the first time ever, with the London Roundhouse concert being filmed and recorded for the DVD / CD release, which hit shops in July. Don’t miss this opportunity to catch Europe live in Australia for the first time ever!